Choosing to make Fountaingate Gardens, a proposed Life Plan Community (also known as a Continuing Care Retirement Community, or CCRC) your home is a great decision. From the impressive services and amenities, to the beautiful campus, to local attractions, to sponsorship by Gurwin, to the focus on successful aging, there is no shortage of reasons to choose Fountaingate Gardens for your active retirement lifestyle. Imagine spending your day out and about on the Fountaingate Gardens campus, meeting up with friends, grabbing a cup of coffee at the Bistro, attending a lecture or doing a little shopping. When you’ve done all there is to do at this proposed community, a relaxing evening may be the next item on your to-do list. That’s where The Maple, just one of Fountaingate Gardens’ numerous apartment home floor plans, comes into play. This one bedroom, one bath apartment home will have just the right amount of space for you to live comfortably in your new community. As you enter the residence, your modern and beautifully appointed kitchen will be the envy of your friends. With a generous layout, there is plenty of space for the home chef, and the open concept living spaces allow the conversation to continue when you grab a drink or snack. With stainless steel appliances and granite countertops, the kitchen’s comfortable breakfast bar makes it easy to imagine this space becoming a gathering spot during get-togethers and grandkids’ visits. The light-filled living space allows the designer in you to create comfortable seating and dining areas while still having plenty of room for your TV or computer work space. There’s also plenty of wall space to hang your favorite artwork or photographs, an essential step for completing the ambiance of your perfect home. Off the living room is a 10’ x 6’ terrace that can easily fit an intimate patio set, or perhaps some gardening pots and boxes to plant your favorite flowers or produce! This outdoor space is the perfect for enjoying your hot coffee on a cool, crisp Long Island morning or a cold beverage on a balmy summer evening. One of the perks of life at Fountaingate Gardens will be enjoying your outdoor space, and looking out at the beautifully landscaped grounds – which you don’t have to maintain! When you leave the living room and head toward the bedroom, you’ll find your personal washer and dryer, a linen closet and a full bathroom. The bedroom features two large windows, allowing in plenty of natural light, and a spacious walk in closet. This room has plenty of space for your King-sized bed, or you could comfortably fit a smaller bed and a reading nook or writing table. 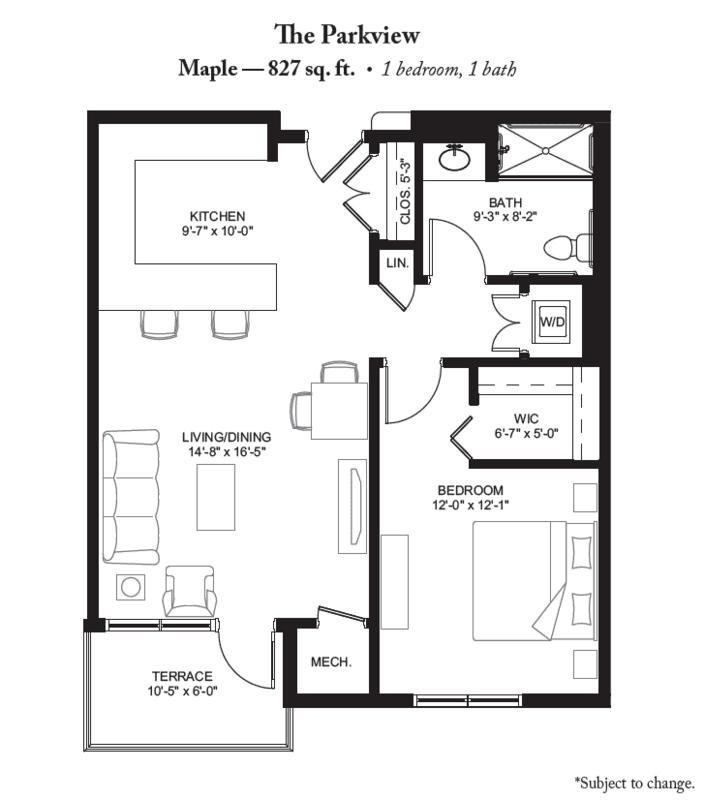 Whatever your passions, The Maple is the perfect apartment home to create your own personal sweet spot. Intelligently designed to maximize the flow and use of space, creating enough room for all of your favorite belongings, there’s no doubt that The Maple will quickly feel like home. For more information on how to select your new residence at Fountaingate Gardens, please give our team a call at (631) 715-2693.